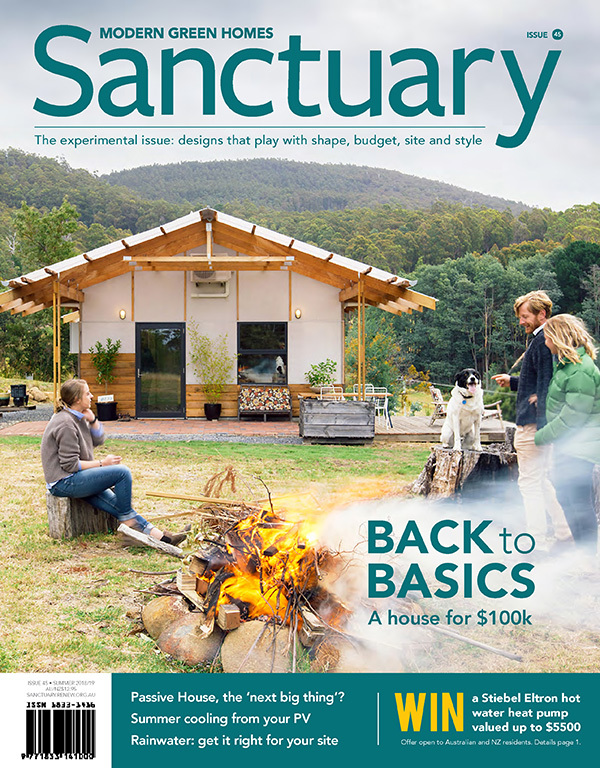 Architect Tess Pritchard and her husband Michael Venning found this underappreciated (and under-valued) block of land in the Adelaide Hills and knew they could overcome its major drawback to create a home that would take advantage of its bushland setting. The battle-axe block is just 650 metres from the nearest suburban train station, but it might as well be in the country, thanks to its sense of peaceful seclusion. It slopes downwards away from a driveway on the northern boundary, where a sewer easement prevented them from building on level ground. 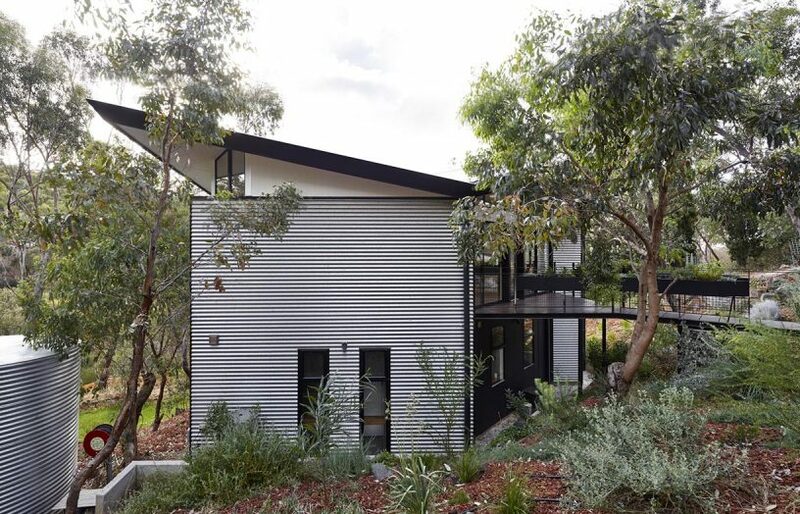 That was no barrier to Tess, who devised a clever design for a house with a small footprint on the lower part of the block, linked to the driveway by a pedestrian bridge. 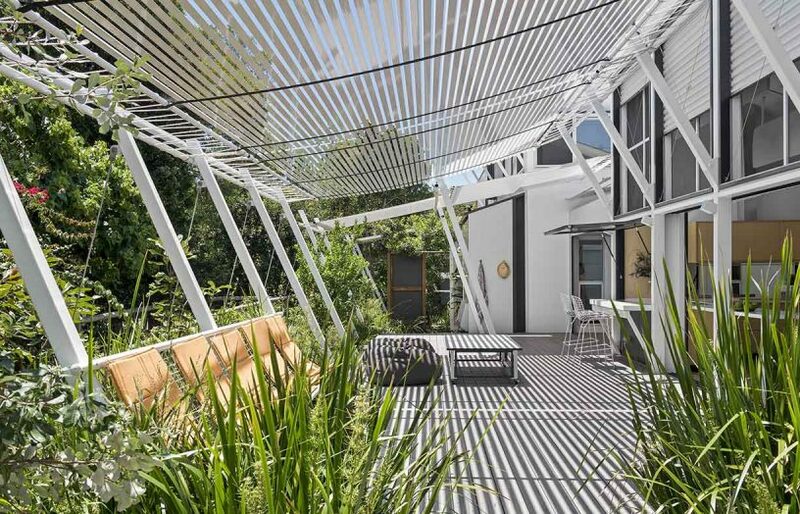 Upstairs, the single space contains living, dining and kitchen areas, which give the impression of hovering in the tree canopy. Decks on either side enhance the feeling of being elevated among the birds, and the entry bridge is lined with yet more greenery: a kitchen garden in custom-made planter boxes. 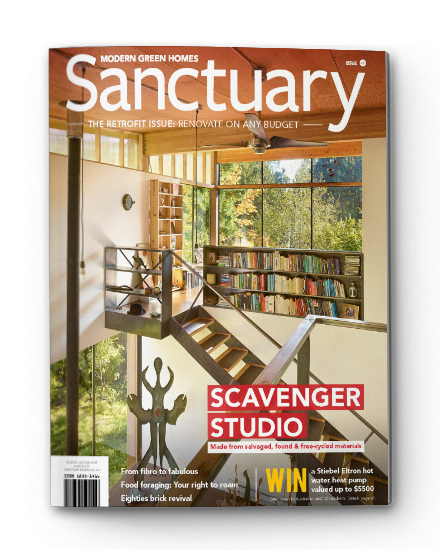 Michael is a sheet metal fabricator and he built these and many other elements in the home, including the bridge, the stair frame and the island bench, which forms a dialogue with the unusual roof form. Tess wanted to imbue the roof with a sense of lightness and dynamic appearance, because it’s the first part of the house that visitors see from the driveway. 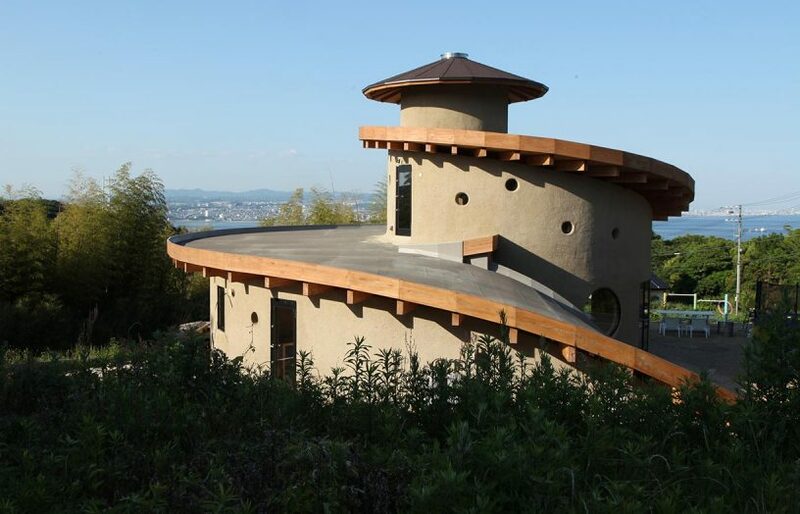 The roof also collects rainwater which is stored in three tanks and reused throughout the house. Collected water lasts the couple for most of the year, and they switch to mains water at the end of the summer when their own supply runs out. They opted to keep hard landscaping to a minimum to reduce stormwater runoff. They have also removed many olive trees – considered a pest in this area – to plant native bushfire-resistant species instead. Shaped like a bow-tie, the house has a diminutive footprint of just 74 square metres but feels much larger thanks to the uplifting roof and several glass walls, which allow natural light to stream in. Tess kept the house’s footprint small to minimise the earthworks required on the sloping site. Entry is via a bridge from the garage to the upper level living space, with bedrooms tucked downstairs. 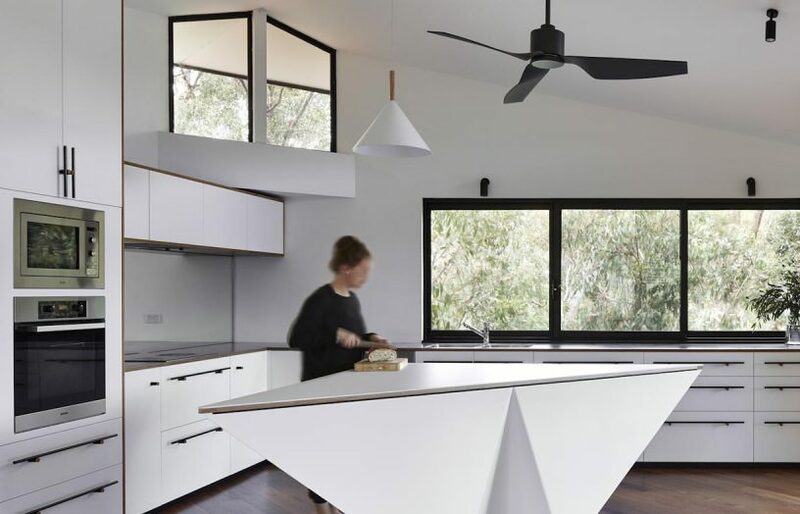 Michael’s metal fabrication skills came in handy for many features of the house, including the island bench in the kitchen, made from folded mild steel and powder-coated. 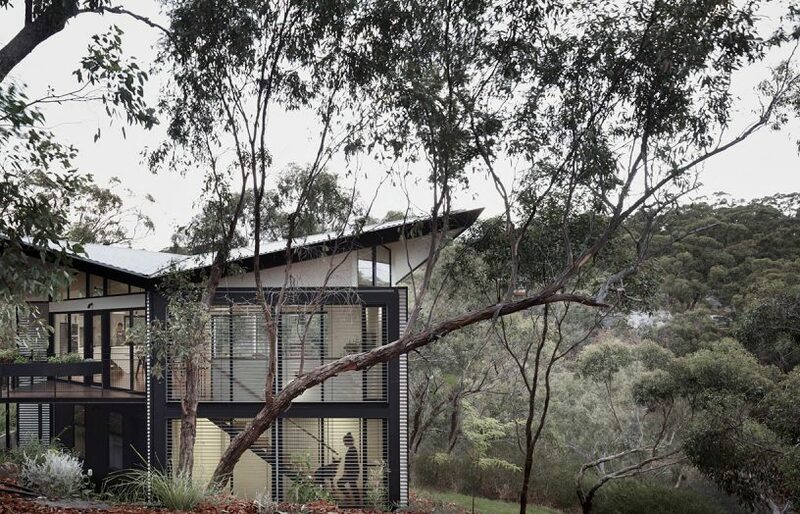 The unusual roof form and extensive glazing helps imbue the small house with a sense of space. 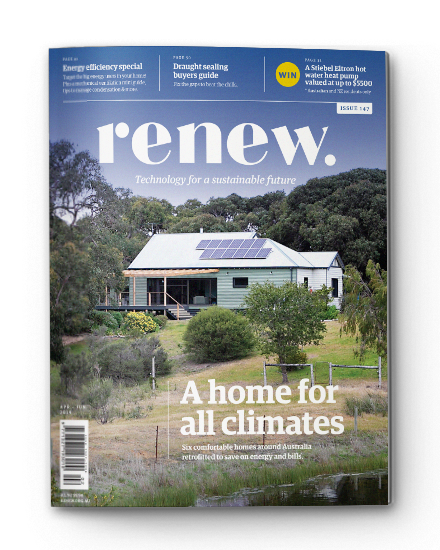 Tess says that treading a fine line between opening to the outlook she desired and thermal performance was tricky in this hot, dry climate, where summer heatwaves are expected to worsen over the next few decades. She consulted Emilis Prelgauskas, a local building energy expert, to help navigate the code requirements while achieving the light and airy outcome she strived for. “It would be easy to achieve a high rating,” said Tess of their decision not to limit glazing, which is a weak link for thermal performance. “But I prefer to connect with the outside more,” she says. Emilis reviews building designs which factor in passive design principles under the National Construction Code’s ‘expert judgement’ provisions, and references post-occupancy data taken once a building is operating. In one of the paradoxes that is inherent in rating tools versus actual performance (this house rated just 6.1 stars using the FirstRate 5 tool), Tess says it is comfortable for most of the year, except the hottest of successive heatwave days when they use the split system. 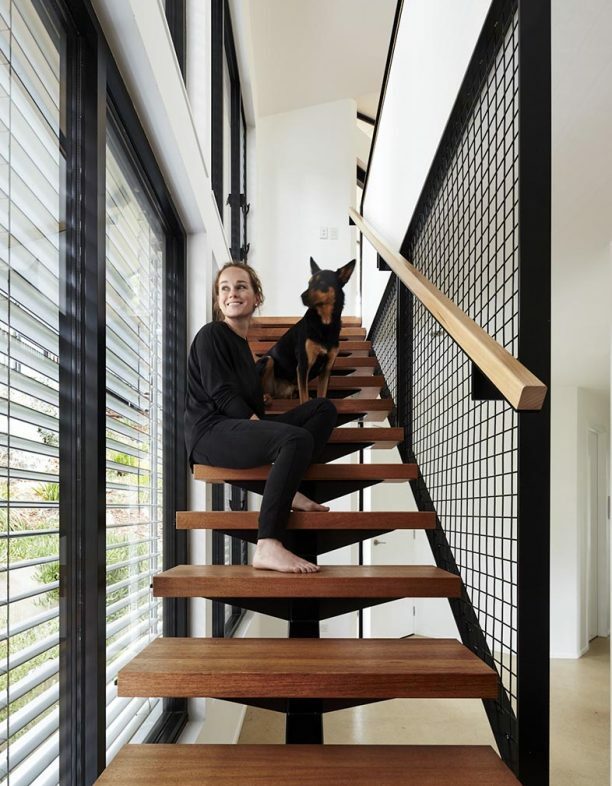 “The plan is angled so that we had one side of the house facing directly to the north, and there is a big double-storey window wall along there,” Tess adds. 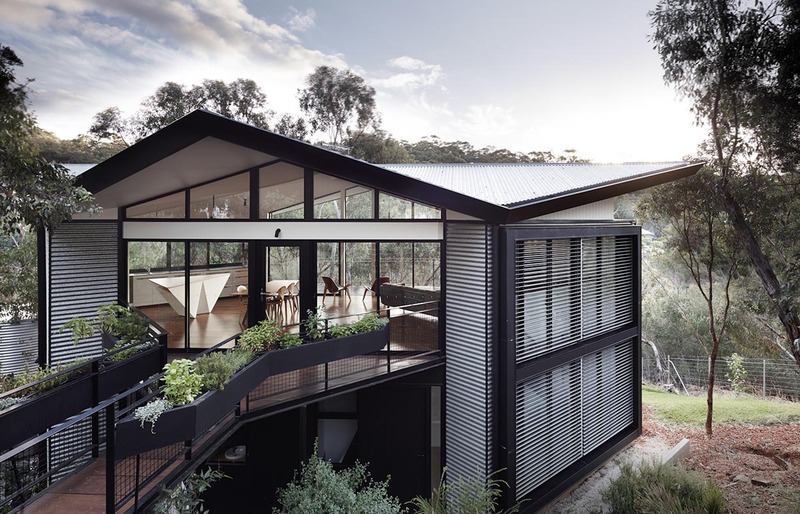 That window wall is one of the few areas where the couple splurged on fittings: they opted for external aluminium venetian blinds that retract completely in winter, and are lowered for summer protection, with blades that can be angled in line with the sun’s arc to keep out heat while still admitting daylight. 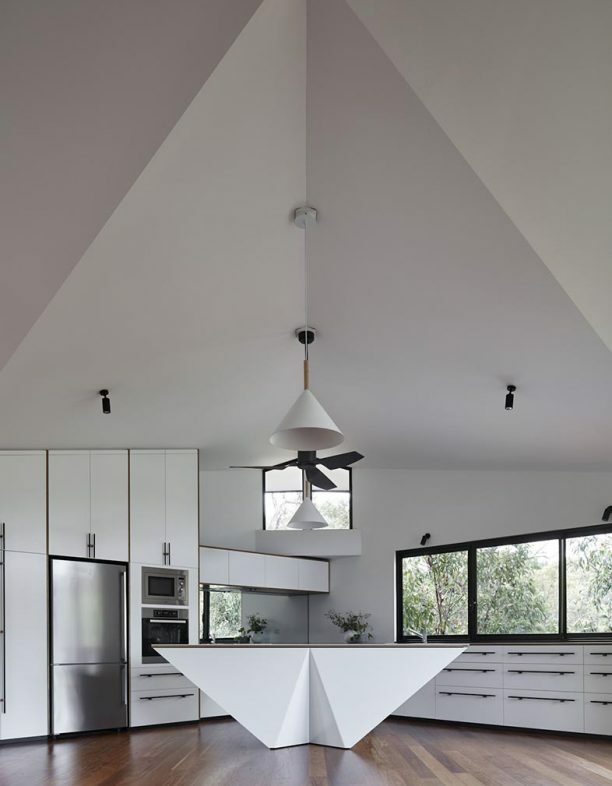 Every room has a ceiling fan and the plan allows the house to be opened up to cooling breezes when they are available. On the hottest days – mostly during Adelaide’s notorious heatwaves – the couple use a reverse-cycle air conditioner they installed upstairs to cool down the main living space. 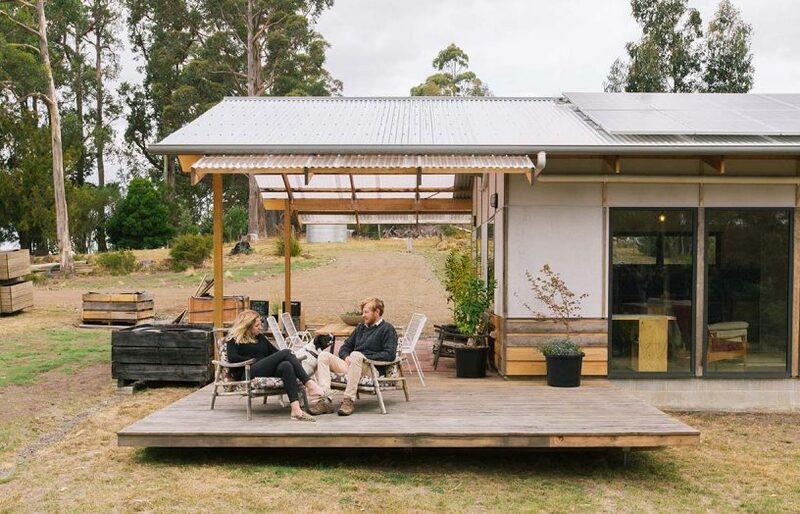 Tess and Michael considered solar panels for the roof – they have no gas connection and all appliances are electric – but the overshadowing caused by surrounding trees made their installation unviable, at the moment. 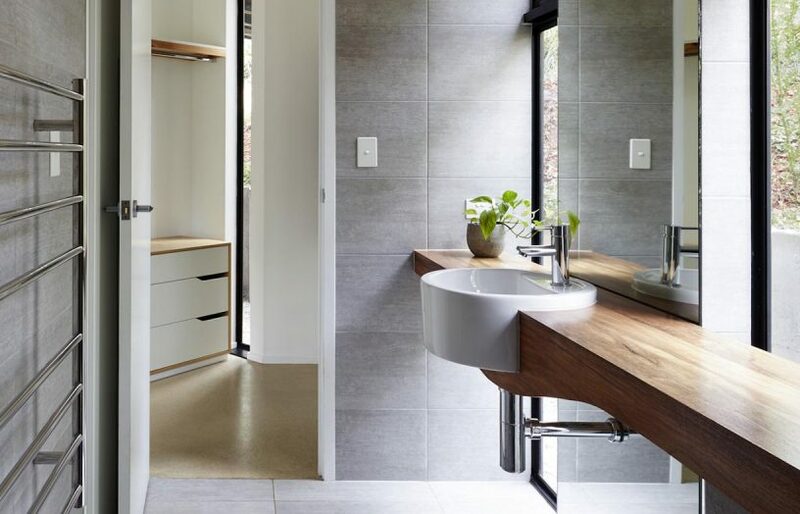 Tess and Michael moved into their new home after a short six-month build and continued work themselves over a period of four years to finalise all of the little details that make this house so special. “Because we were doing so much of it ourselves, Michael’s skills saved us an awful lot of money,” Tess says. Now that it’s complete, the couple are enjoying the spoils of living in a home of their own making, on a large block of land – 2200 square metres – not far from the city and nearby services. It’s a dream come true and bodes well for the future, when they hope to start a family. Samsung split system to main upper level living area; 2 ceiling fans to upper level living area; Ceiling fans to each bedroom on lower level. Floor plan is angled to achieve large double-height northern window wall with external adjustable venetians to control the sun through the seasons; Narrow floor plan with large sliding doors to assist in cross ventilation; Windows to west minimised with a deciduous tree planted externally for summer shading; Light, reflective cladding for walls and roof to limit heat gain. Concrete slab to lower level; Blackbutt engineered floorboard to upper level; Revolution Roofing Truoak deep galvanised wall and roof cladding; Scyon Axon fibre cement sheeting to remainder of walls; Insulation: Aircell under roofing + R4 batts; walls R2.5 batts; Stegbar aluminium-framed double-glazed windows.